We're pleased to have Scott Brinker, a thought leader and entrepreneur at the intersection of marketing and technology, as the newest contributor to our sister blog from our friends Down Under called "Left of the Date Line." 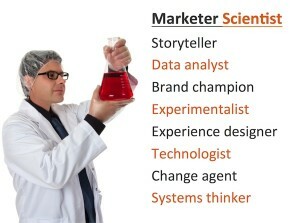 In his first post for that blog, he explores the idea that everyone in marketing should strive to become what he's called a "marketer scientist," which is a hybrid mélange of scientist and artist. There's a nice symmetry to the way he's laid out four characteristics each for the scientist part and the artist part of this renaissance persona, and the idea is not to strive to be an expert in all eight of these ways, but to strive to have a little piece of all eight of these in their thinking. Evolve your Charles Darwin to surreal heights with some Dalí. Integrate your Einstein relatively with your Rodgers & Hammerstein. Impress your inner Nate Silver with an accurate Monet. Have your Dr. Sheldon Cooper born that way with a Lady Gaga alter-ego. Or fill in your own favorite scientist and artist - you get the picture. Do read his post to get the picture in technicolor and surround-sound. And keep checking for more great perspectives from Scott on Left of the Dateline. He's also on Twitter as @Chiefmartec.